As of [Fri 10 Nov 2017], a total of 2119 confirmed, probable and suspected cases of plague, including 171 deaths (case fatality rate: 8 percent), have been reported by the Ministry of Health of Madagascar to WHO. From 1 Aug through 10 Nov 2017, 1618 (76 percent) cases and 72 deaths have been clinically classified as pneumonic plague, including 365 (23 percent) confirmed, 573 (35 percent) probable and 680 (42 percent) suspected cases. In addition to the pneumonic cases, 324 (15 percent) cases of bubonic plague, one case of septicemic plague, and 176 unspecified cases (8 percent) have been reported to WHO. Up to 82 healthcare workers have had illness compatible with plague, none of whom have died. 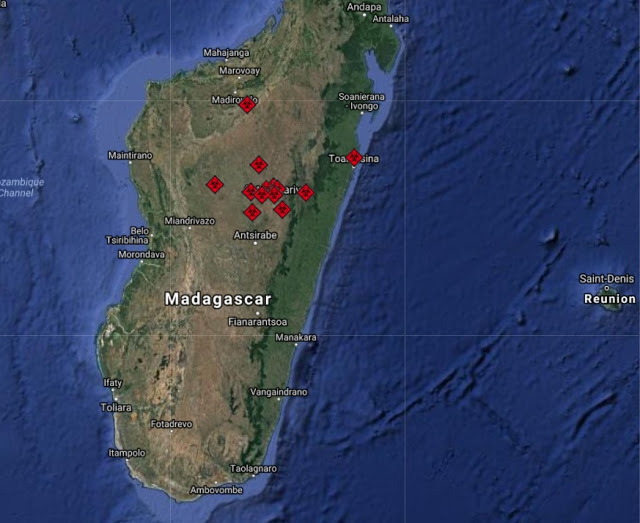 From 1 Aug through 10 Nov, 16 (out of 22) regions of Madagascar have reported cases. Analamanga Region has been the most affected, reporting 72 percent of the overall cases. As of [Fri 10 Nov 2017], 218 out of 243 (90 percent) contacts under follow-up were reached and provided with prophylactic antimicrobials. Since the beginning of the outbreak, a total of 7122 contacts were identified, 6729 (95 percent) of whom have completed their 7-day follow up and a course of prophylactic antimicrobials. Only 9 contacts developed symptoms and became suspected cases. Laboratory confirmation of plague is being conducted by the Institut Pasteur of Madagascar, National WHO Collaborating Center for plague in Madagascar. Up to 25 isolates of _Yersinia pestis_ have been cultured and all are sensitive to antimicrobials recommended by the National Program for the Control of Plague. The number of new cases and hospitalizations of patients due to plague is declining in Madagascar. The last confirmed bubonic case was reported on [Tue 24 Oct 2017] and the last confirmed pneumonic case was reported on [Sat 28 Oct 2017]. Since plague is endemic to parts of Madagascar, WHO expects more cases to be reported until the end of the typical plague season in April 2018. It is therefore important that control measures continue through to the end of the plague season.